Key West Metal Industries, Inc. - Chicago Millwrights, Rotating Equipment, AHU, Pump, Turbine, and Bearing installation and service. 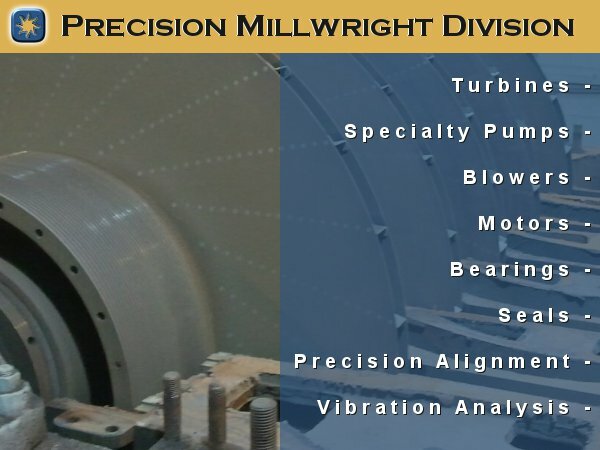 Our Precision Millwright Division provides various services to our valued customers. We are a full service mechanical contractor which employs skilled tradesman. Our services include but are not limited to the installation, removal, repair, alignment, and diagnostics of all rotating equipment. We can also provide preventive and predictive maintenance programs. Our highly skilled rotating equipment team, specializes in air handling unit (AHU) repair and installation. We also offer pump installation and repair. Whether you have a simple ansi end suction pump or a 100,000 gpm split case pump, our precision millwrights can handle the job safely, and efficiently. We also specialize in laser alignment, utilizing a Rotalign Pro to address your coupling/shaft alignment needs. We are able to provide maintenance contracts to fit your company's individual needs.